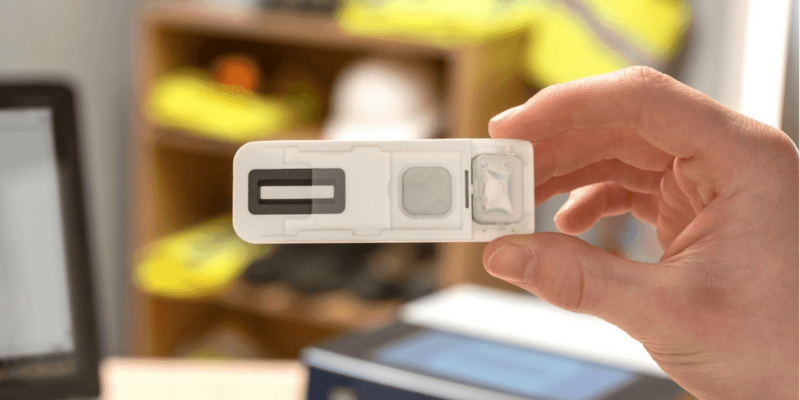 Intelligent Fingerprinting is bringing new levels of convenience, hygiene and speed to workplace drug testing for the transport and logistics industry with the availability of a simple, end-to-end drug testing solution based on fingerprint sweat analysis. 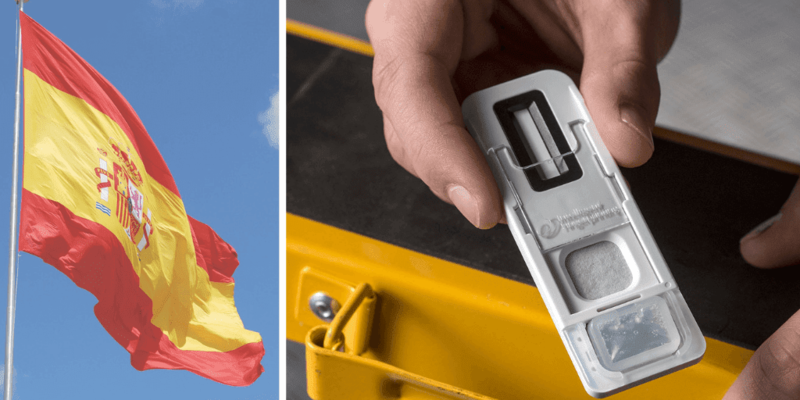 Unlike traditional urine or saliva-based drug tests that can be invasive, time-consuming and undignified for testers and employees, the portable Intelligent Fingerprinting drug testing solution is quick and easy to deploy wherever it is needed across today’s transport and logistics operations. The fingerprint-based system supports all forms of workplace drug testing including pre-employment screening as well as random and for-cause testing, whether in the office or before/after shifts for drivers of all types of vehicle – from forklifts or multi-drop light vans to PSVs and HGVs. The new end-to-end system features an initial screening test that works by analysing sweat from a fingerprint to determine if an employee has recently used cocaine, opiates, amphetamines or cannabis. Sample collection takes only five seconds, with simultaneous screening results for all four drug groups provided in just eight minutes. Should an employee or contractor’s drug screen test positive – in contravention of a transport or logistics firm’s existing Health and Safety or drug misuse policy – the tester would then use Intelligent Fingerprinting’s Fingerprint Collection Kit for Laboratory Analysis to collect samples for a confirmation test. The kit for the laboratory confirmation service also includes everything required to securely send the collected samples to the testing laboratory, including a tamper-evident security bag, barcodes to maintain anonymous sample identity and a postage-paid returns envelope. Intelligent Fingerprinting’s Dr Paul Yates said: “With the Department of Transport reporting a seven-fold increase in convictions for drug-driving since 2015(1) there’s an increased pressure on transport and logistics firms to ensure that their drivers are both alcohol and drug-free. Under the Health and Safety at Work etc Act 1974, transport and logistics firms have a duty to ensure, as far as is reasonably practicable, the health, safety and welfare at work of their employees, so an effective drug screening and testing service should be a critical element of any workplace drug policy. 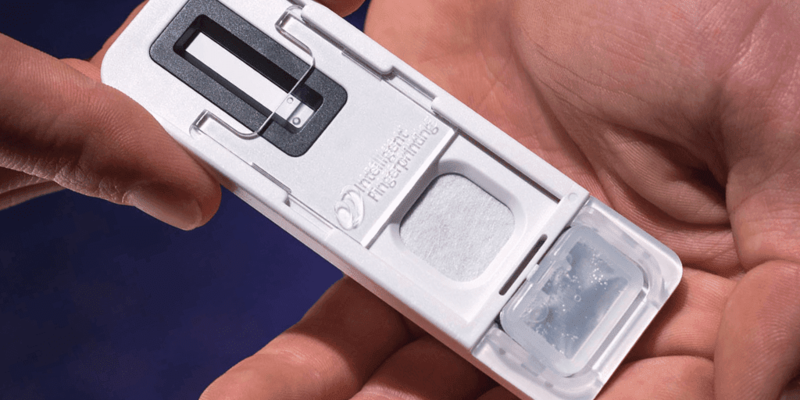 Intelligent Fingerprinting’s end-to-end drug testing solution for transport and logistics firms features a single-use, tamper-evident drug screening cartridge that takes just five seconds to collect a sweat sample. The Intelligent Fingerprinting portable analysis unit then reads the cartridge and provides a positive or negative result on-screen for cocaine, opiates, cannabis and amphetamines in under ten minutes. Should an employee’s initial screen prove positive for any of the four drugs tested – in contravention of a firm’s drug policy – two further samples for confirmation are gathered using the Intelligent Fingerprinting Fingerprint Collection Kit for Laboratory Analysis. Informed written consent is obtained from the donor prior to sample collection, along with a statement of the donor’s prescription medication, if applicable. Once the confirmatory samples have been collected, the Fingerprint Collection Cartridges are sent in a tamper-evident security bag to Intelligent Fingerprinting’s partner laboratory for analysis. The laboratory then provides the transport or logistics firm with a Certificate of Analysis that reports the amount of drug detected in the sample provided. (1) Evaluation of the new drug driving legislation, one year after its introduction. A report for the Department of Transport April 2017.